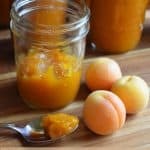 This low sugar apricot jam recipe is a great way to use up any apricots with bumps, bruises or bird pecks. Our gardening zone is right on the edge of where it's “safe” to grow apricots, so our crop often gets nipped by a late frost. When we get a harvest, I don't want any of them to go to waste! I sweetened this jam with local honey that I buy in bulk, but you could also use granulated cane sugar. (See note below.) I used Pomona's Pectin for thickening, but you could substitute another low sugar pectin and adjust the recipe accordingly. 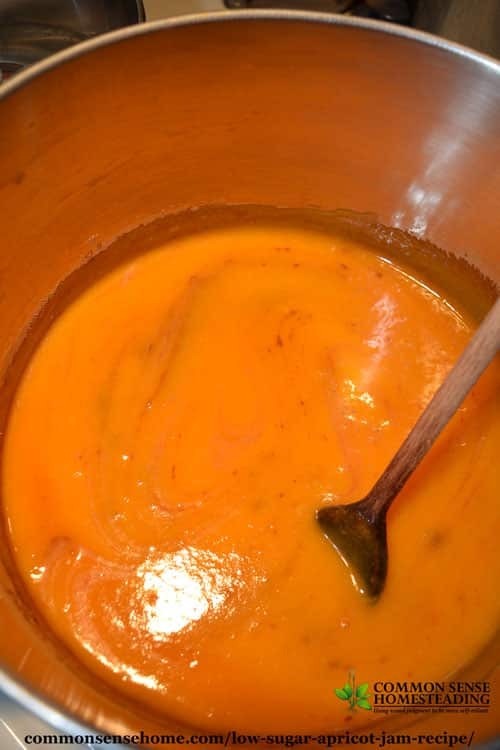 I found out the first time I made this jam that our apricots have a plethora of small, wiry hairs around the pit that become more pronounced in jam, so now I use the food strainer to process our apricots into a puree instead of chopping and mashing them. This may be an issue only with northern hardy varieties – I'm not sure. Use your judgment to decide how you'd like the texture of your jam. 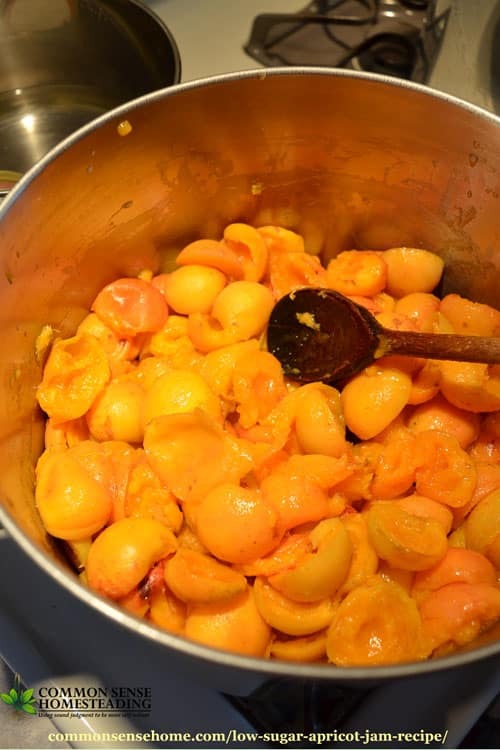 To make apricot puree – pit apricots, place in heavy bottomed stock pot. Cover and cook gently until tender. Process through a food strainer or food mill. Print friendly version at bottom of post. Sterilize six 8-ounce jars, keep hot. Prepare two piece lids. Fill water bath canner and bring to boil. In a small bowl, mix together honey and pectin powder. Don’t skip this step, or your pectin will clump. Set aside. In a large, non-reactive pot (I use a heavy bottom stainless steel pot), combine apricots, lemon juice, cinnamon and the calcium water. Bring to a full boil. Add honey-pectin mixture, stir vigorously 1-2 minutes while cooking to dissolve pectin. Return to boil and remove from heat. 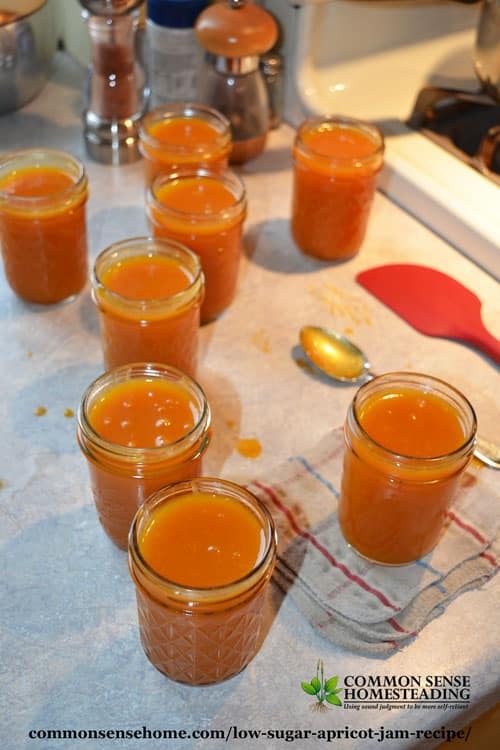 Ladle jam into sterilized jars leaving 1/4″ headspace. Wipe rims clean and screw on the lids. Process for 10 minutes in water bath canner (add 1 minute for every 1,000 feet above sea level). Jam will last about three weeks once opened. Makes around 5-6 cups. Recipe may be doubled. 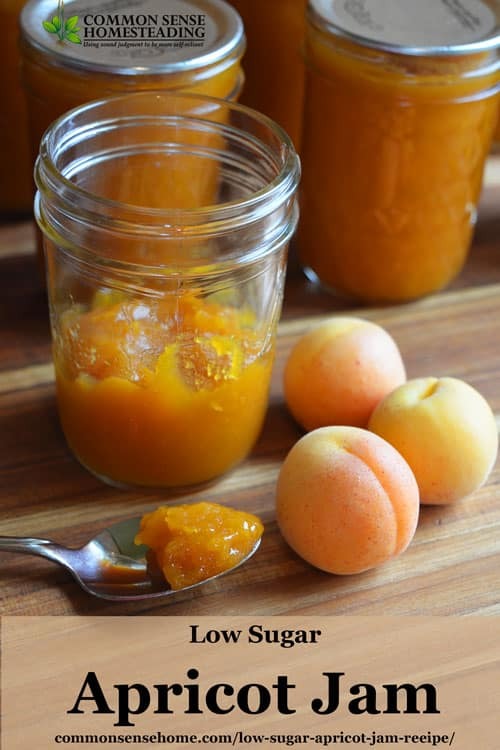 If you don't have apricots available, you could also use peaches or plums. All go well with cinnamon and a bit of lemon. If you need a good bread recipe to pair up with your apricot jam, check out “13 Homemade Bread Recipes – Never Buy Bread Again“. I really like making jams and jellies with Pomona's Pectin, as most conventional jam and jelly recipes call for as much or more sugar than fruit. The low sugar jams and jellies taste like fruit instead of sugar. Pomona's Pectin also came out with a new recipe book recently, which I have not tried yet, but it looks interesting. It's called, “Preserving with Pomona's Pectin: The Revolutionary Low-Sugar, High-Flavor Method for Crafting and Canning Jams, Jellies, Conserves, and More“. Using granulated sugar will change the flavor. I do check and make sure the label says, “cane sugar”, as most granulated sugar in the U.S. is now made from genetically modified (RoundUp Ready) sugar beets. Buy in bulk and watch for sales. Sugar will keep indefinitely in an airtight container. It is a good food preservative because it ties up free water in the product, preventing bacteria from breeding. It also helps preserve color and texture, keeping fruit bright and firm. In a pinch, sugar and honey can also be used for the care of open wounds. 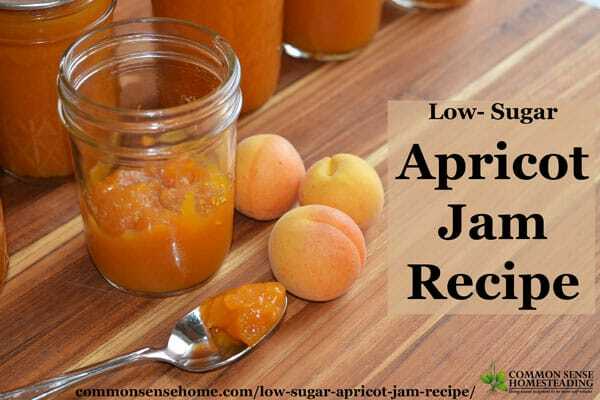 This low sugar apricot jam recipe is lightly sweetened and flavored with a hint of cinnamon and citrus so you can taste the fruit, not the sugar. In a large, non-reactive pot, combine apricots, lemon juice, cinnamon and the calcium water. Bring to a full boil. Originally published in 2013, updated in 2016, 2017. Your post is so timely! I made a pepper relish recipe substituting Pomona’s pectin for the Sure Jell. Oops. It isn’t an equal substitution. And the recipe off the internet wasn’t quite correct. But your post helps me see what I did wrong and how I’ll fix it for the next batch! Thanks! This looks great… naturally grown. Congrats on your harvest- I’ll try the recipe, albeit, with store bought apricots :0( Thanks for sharing! It’s a white powder that’s included with the Pomona’s Pectin. It helps with the gelling process. You’ve been added to the group. I have it closed in an attempt to limit spammers. Welcome! Can you substitute powdered honey for the honey or sugar called for? I’ve never used honey powder, but after looking up what’s in it, it should work. I’d probably use one cup per batch. Many people like using honey because it can be locally sourced. Using added pectin allows the jam to cook up more quickly than slow cooking with naturally occurring pectin, giving a fresher fruit flavor. If you have your grandmother’s recipe, you’re welcome to share it here, too.